EUGENE, Ore. -- Nov. 11, 2015 -- University of Oregon scientists have found that strength in numbers doesn't hold true for microbes in the intestines. A minority population of the right type might hold the key to regulating good health. The discovery, based on research using zebrafish raised completely germ free, is reported in a paper published in the Nov. 11 issue of Cell Host & Microbe. The findings provide a path to study the function of each bacterial species in the gut and to eventually, perhaps, predict and prevent disease, says lead author Annah S. Rolig, a postdoctoral researcher in the UO's Institute of Molecular Biology. "Until now, we've only been able to capture proportional information, like you'd see displayed in a pie graph, of the makeup of various microbiota, in percentages of their abundance," Rolig said. "Biologists in this field have typically assumed an equal contribution based on that makeup." That thinking is now changing, Rolig said. 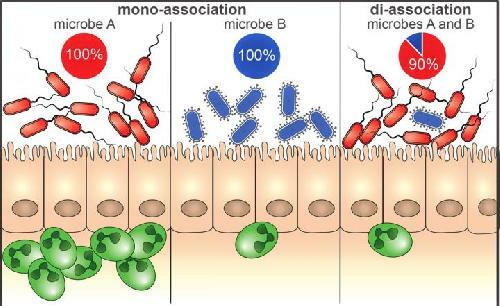 "The contribution of each bacterium is not equal. There is a per-capita effect that needs to be considered." To develop a model to capture per-capita contributions of microbes in a population, Rolig and her co-authors -- biology graduate student Adam R. Burns, microbiologist Brendan Bohannan of the Institute of Ecology and Evolution and biologist Karen Guillemin, director of the META Center -- turned to UO physicist Raghuveer Parthasarathy. His math-driven model, detailed in the paper, provides formulas that predict collective inflammatory responses of combinations of bacteria. "I'm really proud of this paper because it exemplifies an achievement of one of the major goals of the META Center for Systems Biology, namely to provide a predictive model of how host-microbe systems function," Guillemin said. "This experimental and modeling framework could be readily generalized to more complex systems such as humans, for example to predict disease severity in individuals with inflammatory bowel disease based on the pro-inflammatory capacity of their gut microbes as assayed in cell culture."